The single seat roadster (monoposto) became known as the Mono Ego at it’s introduction at the 1997 Geneva International Automobile Show. This front engine car has a Keene Bell supercharged 4.6 liter Ford Cobra 4 cam engine, all independent suspension, disk brakes, air conditioning, etc. The car was commissioned by Rinspeed Design of Switzerland. 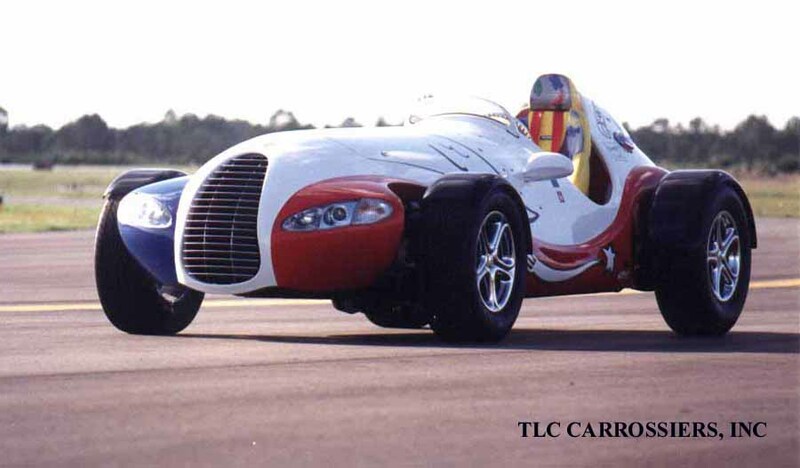 TLC Carrossiers Inc designed and built the car in approximately 6 months. 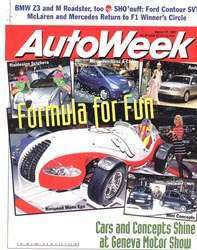 Pictured on the cover of Autoweek for March 17, 1997 it was their choice for Best Concept. The paint and decorative schemes are the product of French fashion designer Jean-Charles de Castelbajac, well known in Europe for these types of schemes on other products. The car body is of Aluminum shaped via the traditional methods of panel beating but with a unique approach. A small clay study model of Rinspeed’s original ‘cigar-like shape’ criteria was made. This was modified to integrate modern lights and incorporate close fitting fenders that move with the wheels and have the unique tire tread pattern. As this was to be a one-off car it was deemed impractical from both schedule and cost to produce the traditional wooden bucks to guide the pannelbeaters. 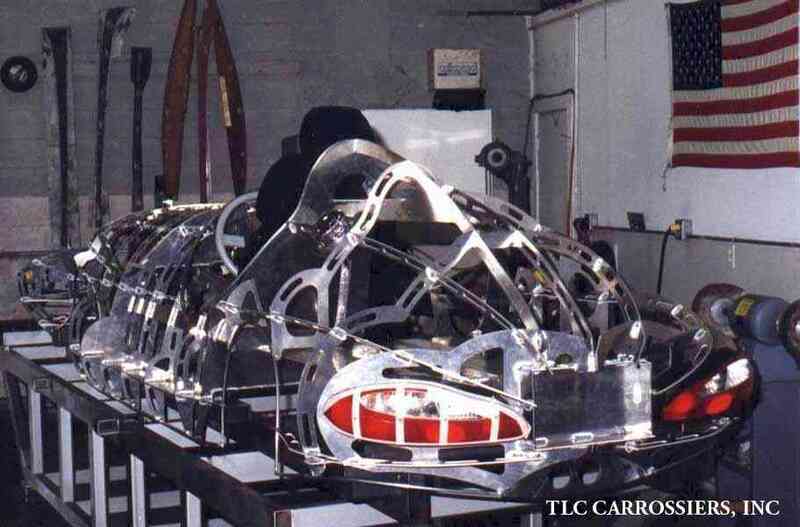 Instead the body shapes were designed in TLC’s 3-D CAD system and integrated with scanned and legacy data of all components. 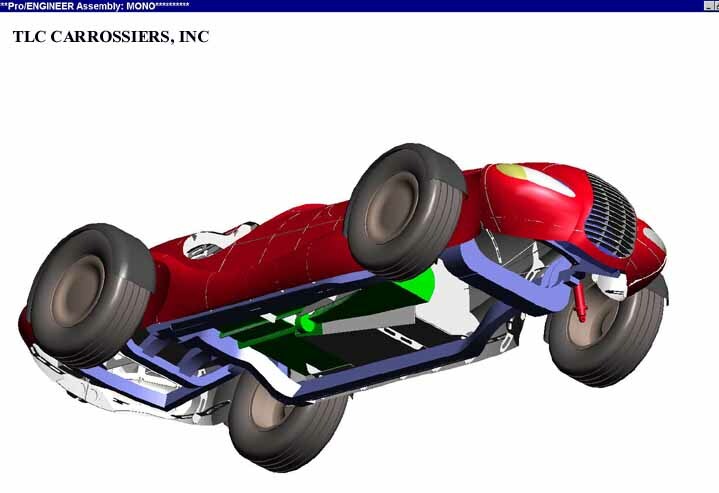 An aluminum ribs & stringer assembly was then designed in the ProEngineer system that would guide the aluminum shaping as well as support it and provide for mounting to the chassis. The ribs & stringer assembly was laser cut from the digital data. Assembly of the ribs and stringers on the CAD designed build fixture was easy as each piece fit into mating slots in the next piece. 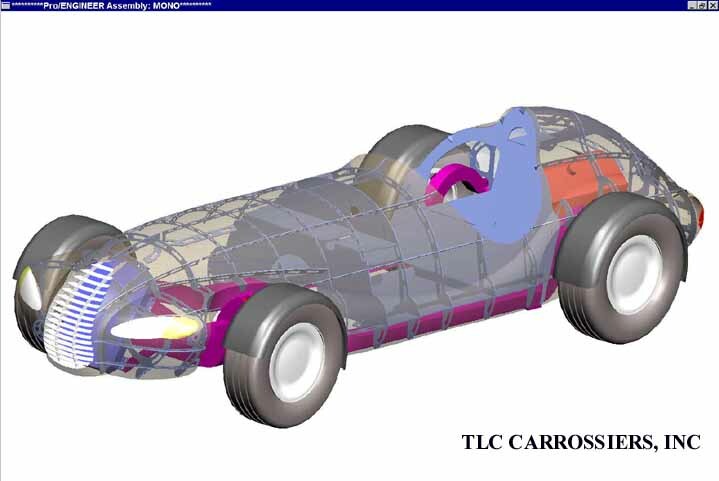 While the panel beaters worked on the body, the chassis was built, knowing that since it was “just” a replication of the CAD data in full size all would fit when the body and chassis were mated. The utilization of a very good CAD system blended with good craftsmanship allows projects of this type to come to reality. 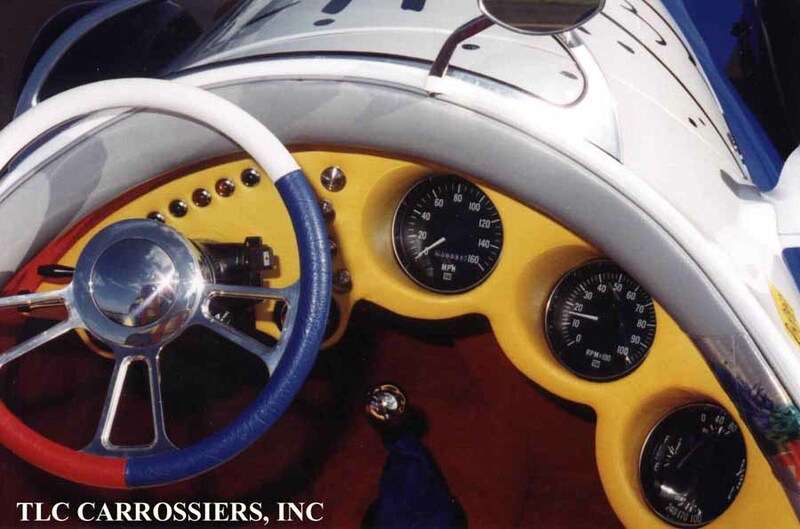 The design premise to honor the shapes of 50’s Indy cars and 30’s Formula racers on a modern chassis, yields a car that is a treat to look at and very responsive and fun to drive. Click on these thumbnail images to enlarge, then right click to save !